Living abroad presents some difficulties to the book lover. I collect books like attics collect dust: it happens spontaneously and no amount of de-cluttering will ever really cut down on the extent to which they fill every corner of my life. But books are a heavy burden for a girl who likes to travel light, which inevitably makes for some difficult decisions. Weary of backpacking across Paris and everywhere else at the end of last summer, I resolved to bring only four books back to Cairo (the decision undoubtedly influenced by the part of my cosmically aware unconscious that somehow knew one of my professors was about to hand me several galleys of his novel to be delivered to a smattering of his coolest Cairene friends, which brought my book ferrying total back up to normal levels just before I boarded my flight). 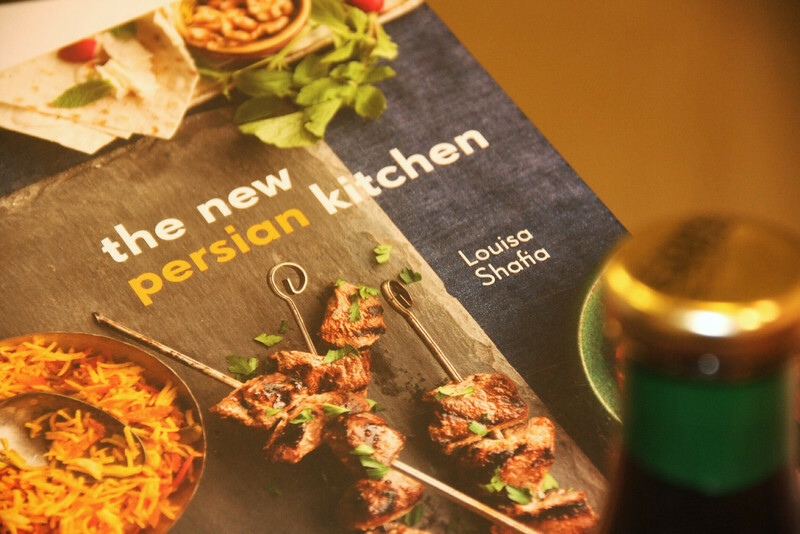 One of them was Louisa Shafia‘s The New Persian Kitchen, which has swiftly become one of my favorite cookbooks. What follows is an adaptation of the book’s Eggplant & Tomato Stew with Pomegranate Molasses, which I had to try because eggplant, stew, and pomegranate molasses are (obviously) three of my favorite things. The three things I refer to in the title of this post, however, are the courses that this delight was sandwiched in between, which don’t photograph so well but which I’ll explain below for other fans of three-course meals. This dish is a lovely meld of sweet and sour, which is such a staple of Persian cuisine, Shafia writes, that it has its own word in Farsi: malas. I dished it out as an accompaniment to a Moroccan style lemon, saffron, and honey chicken (sweet & sour also being a hallmark of a certain corner of Moroccan cuisine) and served it on a breezy balcony in Cairo earlier this fall. As we ate, it came out that Bassem Youssef‘s satirical show (the program The Program) had been abruptly pulled off the air. That night our number included that staple of the best Cairo gatherings – a personal friend of Bassem’s “from before he got famous” – which rendered the disappointment just a little more numbing and a little more personal as we sifted through our Twitter feeds in search of answers. But sometimes (as a very wise cousin of mine once told me) there’s nothing to get to the bottom of, or at least not until the curfew lifts. In such situations, the only sensible thing is to finish off the night with a few helpings of peaches & orange saffron cream and a side of hot toddies. Absent Bassem’s humor and wit, I would say the eggplant dish was the star of the evening. But that would probably invite some sort of crack about foreign hands. Adapted from The New Persian Kitchen by Louisa Shafia (see another recipe from her book here). I altered the original recipe considerably, owing to a lack of split peas, grapeseed oil, and an oven. 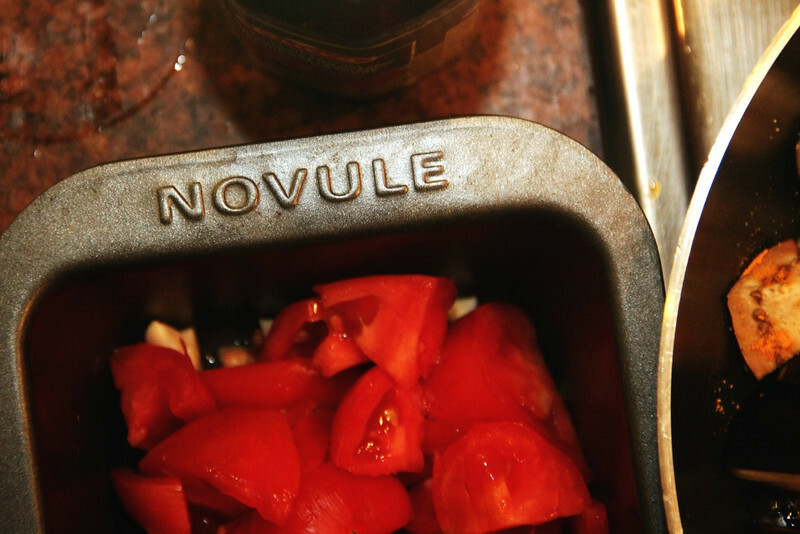 I used chickpeas and olive oil instead, and devised an alternative to roasting the eggplant. Now wait a minute, say my American friends. You are always going on and on about pomegranate molasses, and how the best kind is from Syria, and that’s all very well but we don’t have that here. My response would be first, well, you might have it in the “vaguely ethnic food miscellany” aisle of your local grocery store. And second: if not it’s ok, because good news: you can make your own. Exhibit A: Make your own pomegranate molasses from Leen Al Zaben, a food photographer and blogger whose gorgeous images put everyone else’s to shame, as far as I’m concerned. 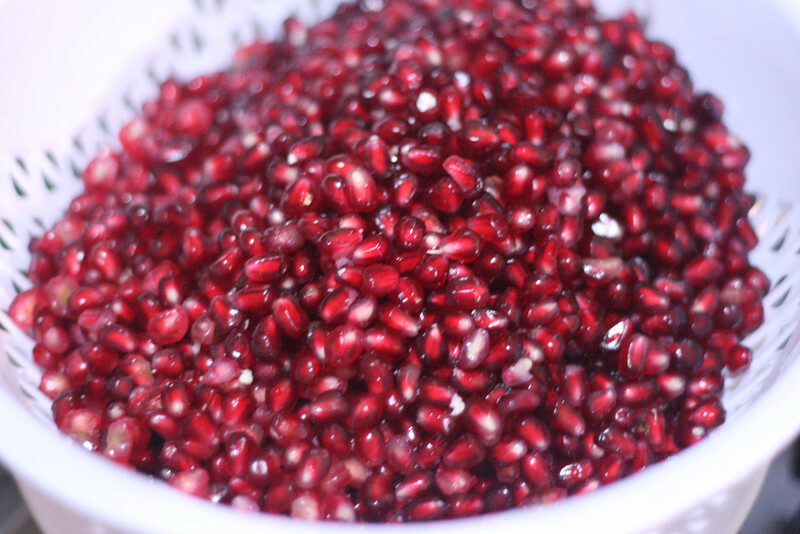 The even better news is you can even make a lazy version of her recipe – which is to start with pomegranate juice rather than with pomegranates – and you’ll still wind up with a pretty marvelous result. This past Thanksgiving I whipped up a simplified version of her recipe (to stir into my Cranberry Pomegranate Chutney, and also into a pot of mulled wine. Also, to help prep a chicken on its way into the oven to roast as the chutney brewed above it) with the addition of a few holiday spices and dried flowers for good measure. But I digress. You’ll need a large and a small saucepan. 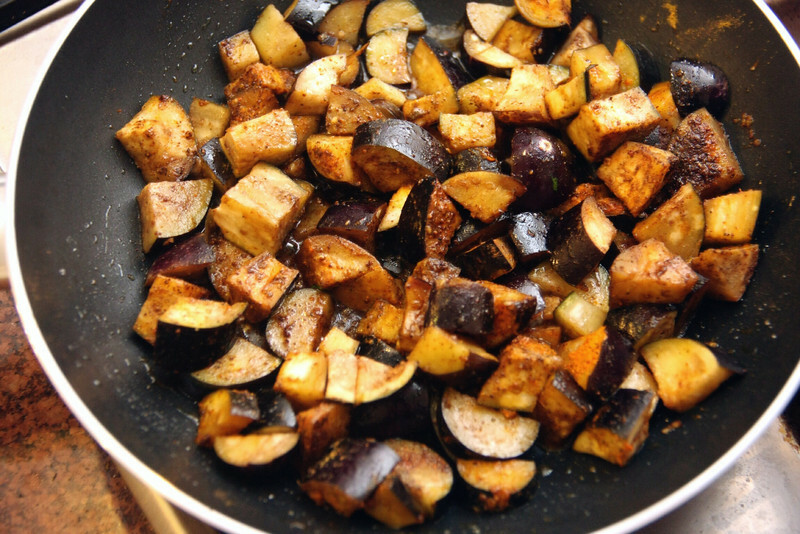 In the larger, slow cook your eggplant pieces on low heat with olive oil, half the pomegranate molasses, and the spices (including a generous sprinkling of salt). Meantime, in the smaller, caramelize the onions: cook with olive oil on medium high until they just begin to turn translucent, then add the honey and reduce heat, cooking on low until the onions is about half their original volume. Stir both dishes occasionally. 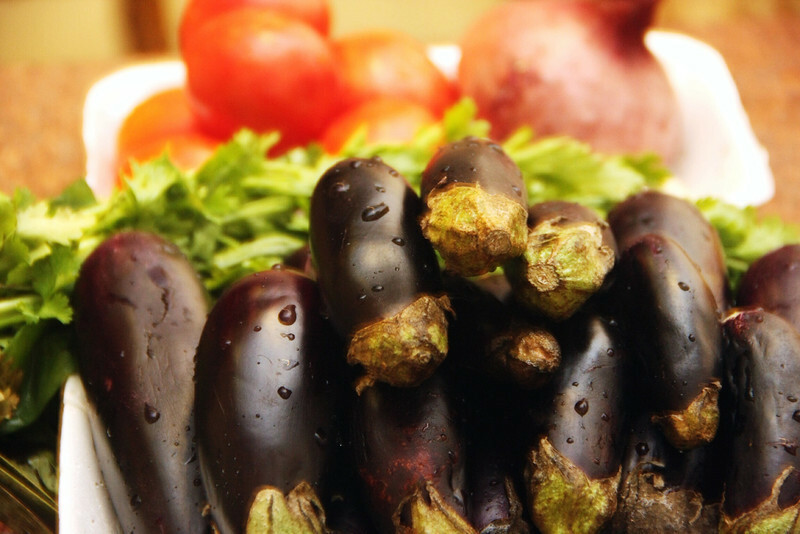 It’s particularly important to stir the eggplant well in the beginning: because it’s cooking stovetop, not in an oven, ensuring that all the eggplant pieces are equally soaking up olive oil will help cook them all evenly and well. After 30 minutes or so, add the onions to the eggplant, toss in the rest of the ingredients, cover with broth, and simmer until reduced to a thick stew. Towards the end start adjusting levels of spices and pomegranate molasses to your liking. The funny thing about food photography is that sometimes the best food just doesn’t photograph that beautifully (you wouldn’t believe the food & entertaining luminaries that have gotten called out on this one lately) and it seems that everything I made for this particular meal fits into this category (hence the artfully out of focus clipped shot below). And so for the rest of the courses, some concise descriptions will have to suffice. To round out the meal: for dessert, whipped cream and peaches is always a good place to start. To dress them up though, seep a few threads of saffron in your cream for a few hours while chilling, then add a spoonful of orange flower water and honey to taste, and whip away. The chicken dish I made to complement the eggplant stew was based on the cooking method behind this recipe but with a few substitutions – it was more or less an excuse to use these marvelous saffron preserved lemons I found in the store the other day (which seem also to hold the key to my shopping list mystery of several weeks ago). Essentially, you follow the recipe linked above, but 1) lose the coriander, almonds, ginger, and garlic; 2) substitute black pepper & marjoram for the ground cinnamon & ginger, and 3) toss in a few preserved lemons halfway through the cooking process. Photos can be found in their natural environment here. If you’re at a loss for holiday gifts in this War-on-Christmas season we now find ourselves in, most photographs on my Smugmug site can be purchased as prints or as greeting cards – and half of all the proceeds from their sales this month will be donated to an organization working to assist those affected or displaced by the conflict in Syria. We also never object to a little facebook love.